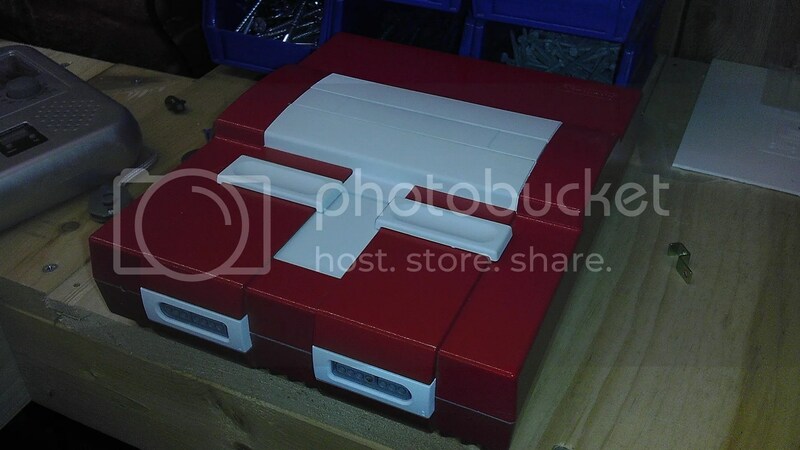 A couple months ago I was approached by an eBay user via email who was interested in the original SNES-001 Advance I finished earlier in the year. Although I had sold it private sale after the bidding ended, he was interested in having me make another for him in time for Christmas. But, this deal appears to have fallen through, but I’d already got so far into it, I decided to keep going and I’ll throw it up on eBay when it’s complete. This system though is going to be vastly superior to the other in almost every way as not only have the controllers been cut using my CNC machine, but the way the signals are being broken out to the controllers is greatly improved and requires no modding at all to the system. Also I’m using all custom cut PCB’s which really gives the original feel of the systems controller and is super strong as far as actual structural integrity is concerned. But I’ve got many plans ahead for both this and my main project which I’ve been working on for about 3 months now. More on that as I get closer to actually developing it into a physical prototype. As for this project though, I’ve started up a build log over on MBB. Please feel free to give it a view for a bit more detail on the build and where it’s going. That’s all for now! Any chance you would be able to make those controllers Wireless?? I think I saw someone do that in a recently researched SNES portable. Also, any chance you’d be willing to sell to one specific buyer–yours truly–rather than auctioned off on eBay? Thank you for reading this! I’ve seen it done as well, but I’ve never tried it. It would require some programming and flashing of an IC to make work correctly which I don’t know much about. I can make the A/V wireless which is something I’m working on but the controller would still need to be plugged in. So that’s something that could be done but the hardware alone to do it would cost a bit more. If I could ask though, (and I do mean this in the most respectful way), I do appreciate that you like my work and could be a potential client for a custom system, but the excessive multiple comments and praise really isn’t necessary. Again, I thank you for the enthusiasm and do appreciate it, and I look forward working with you but I’m pretty simple and approachable making posts across multiple pages not needed. But we’ll take it from there and I’ll talk with you soon. Take care! Doom 3 BFG Edition Is Here!